Over the past few weeks I have spent a considerable amount of time in Europe reviewing the macro-economic landscape with my colleague Aidan Corcoran, who joined the KKR Global Macro & Asset Allocation team through the Firm’s recent acquisition of Avoca Capital in Dublin, Ireland. As part of his full integration, we spent several days in July meeting with European business leaders, government officials, and other macro-economic advisers to further refine our views on the region. What we detail below are – literally – some of our “Thoughts from the Road” after recent trips to Spain, Italy, the Netherlands, Greece, and the United Kingdom. To be sure, Europe’s macro backdrop is more stable today than it was when I joined KKR in 2011. However, Aidan and I certainly uncovered enough macro tension points to refute the “boring old aunt” image. In terms of investment implications, we think there are quite a few important considerations. For starters, traditional consumption stories are likely to lag as we believe real wages are not poised to increase any time soon. Consistent with this view, we see no real demand for bank credit, a trend that is likely to impact everything in Europe from banking to fixed investment to central bank policy to non-bank lending. On the other hand, we found a lot of companies and areas of the regional economy that are seeing significant market share gains as consumers “trade down” in an environment of modest real wage growth. Margin expansion and/or consolidators should also be favored in instances where low inflation and growth headwinds are likely to persist. Separately, we think that certain parts of the banking sector, including both debt and equity, look attractive after the recent sell-off. The catalyst for the turnaround, we believe, will be the finalization of the ECB’s bank stress test in October 2014. Finally, despite being at post-crisis lows, we think sovereign risk premiums are actually likely to grind in even further, as the European Central Bank (ECB) not only normalizes, but also lowers liability funding costs throughout the region more than the consensus now thinks over the next 3-4 quarters. If we are right, we think both long duration and credit assets should continue to do well in the near term. Our bigger picture view is that both a local presence and a bigger toolkit are now increasingly required to succeed in Europe. European countries are moving in vastly different directions, with diverse macro-economic and political trends that have increased the complexity of the opportunity. For example, whereas Spain is now using exports to bolster its growth prospects, Greece is relying on services, tourism in particular, to drive positive real GDP growth for the first time since 2007. Bottom Line: To capitalize on these continually shifting nuances, we believe one has to have a local presence, deliver deep industry expertise, and support all facets of a corporation's capital structure. Below we provide some color to what we think represent the key point of our Thoughts from the Road in Europe. That said, our discussions lead us to believe that the recent growth pause in Europe is indeed just a pause. Key to our thinking is that housing finally seems to be bottoming in countries like Greece and the Netherlands, which has implications for net worth, confidence, and ultimately job creation. We believe that, coupled with ongoing strength in exports as the global economy improves in 2H14, Europe too should see a rebound in its growth prospects back towards modest sustainable economic growth of 1.0-1.3%. Already, July PMIs have indicated a decent start to 3Q14, with the Eurzone composite number rising to 54.0 from 52.8.2. 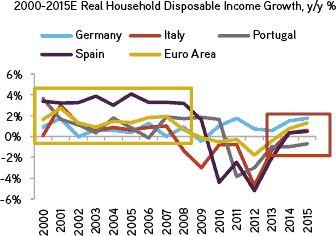 Within Europe, though, we continue to see a variety of economic trajectories unfolding. In Spain, for example, successful labor reform has clearly given the country significant structural momentum. As such, we now think that the break-even real GDP growth rate needed to add jobs may be just 0.75% this cycle, down from a historical level of 2.0%3. We believe this lower threshold for net job additions is significant as non-performing loans are 0.96 correlated with employment trends4. Meanwhile, growth in the U.K. is now running above the U.S., and we expect Germany’s recent slowdown may be temporary as demand for its exports remains robust5. On the other hand, Greece, Italy, France, and the Netherlands must all do more to drive reforms, reduce debt, and improve growth. While all these countries face significant macro challenges, we departed feeling Italy was the most downbeat as we think labor inflexibility, red tape, and high input costs (e.g., gasoline is around $10.00 a gallon, 30% higher than many European peers) all remain challenges6. Recent actions by the ECB are likely being under-estimated by the market. We left Europe thinking we might have been looking at the ECB situation incorrectly. Specifically, whereas earlier in the year we had been arguing that the ECB would narrow the lending rates between SMEs in countries like Spain and Italy versus Germany, we now think that the ECB is aggressively trying a different path. Specifically, through its new “Targeted” Longer-Term Refinancing Operation (T-LTRO), the ECB is now aggressively trying to normalize the liability – not the asset side of the equation – by reducing fund costs in the periphery. One can see the extreme level of dispersion across Europe in Exhibits 1 and 2, which shows some quality research done by Huw van Steenis at Morgan Stanley. Note: (1) Ireland is available for total maturity, instead of up to 1 year. Data as at May 2014. 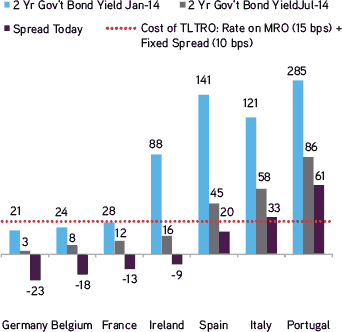 Source: ECB, Datastream, Bloomberg, Morgan Stanley Research Deposits and Loan Tracker, July 2014. Data as at July 2, 2014. 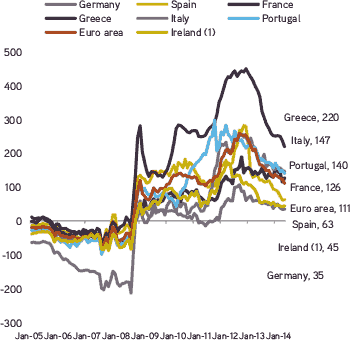 Source: ECB, Bloomberg, Morgan Stanley Research Deposits and Loan Tracker, July 2014. That said, we are not sure Greece will significantly benefit from the T-LTRO, given the lower availability of collateral required to really take advantage of the program. As such, we expect the government and the banks may need to take a more pro-active approach to their $70 billion NPL problem. Importantly, this liability targeting by the ECB does not rule out the central bank also remedying the asset side of the equation by later targeting ABS purchases. However, our view is that the ECB will wait to see how effective the T-LTRO initiative is before it launches an ABS program. Also, the ECB is unlikely to buy assets until it has cemented its role as bank supervisor in 4Q14. Our bigger picture conclusion is that we now feel like the ECB is more willing to be overly-supportive on the monetary side of the equation in order to offset the impact of the Asset Quality Review and associated recapitalizations. In Spain we think banks could now be over-reserved, with perhaps one or two exceptions; by comparison, in Italy and Germany, our research leads us to believe that under-reserving, excess leverage, or outsized cross holdings likely mean that certain banks will face capital adequacy “hiccups” in the weeks ahead. Given our view on Draghi’s strong resolve, we also think that many of Europe’s big broker dealers will grudgingly be forced to get long sovereign bonds at what they view as already rich values. Our bottom line: While the ECB may lack the Fed’s flare for shock and awe, its “new” program is likely to be more powerful than the consensus now thinks. In our view, the ECB will not only likely get its way on reducing funding costs, but is also likely to force institutional investors to extend duration and/or buy more credit on the asset side of the equation. Either way, risk assets are likely to benefit. Maybe even more important than the program itself is the signal the ECB has sent that its balance sheet is available to “do whatever it takes” to preserve the integrity of the monetary union, something that was lacking during the earlier part of the crisis. Given this view, we think the potential for risk premium in Europe to fall further remains significant. Real wage growth and demand for credit remain elusive; these insights should help drive investor capital allocation. After talking to a slew of business executives and macro players all across Europe, it almost felt like Déjà vu. Specifically, similar to the environment we witnessed in the United States following the Great Recession, Europe is now enduring an extended period of modest wage and credit growth. In particular, housing woes, weakened business confidence, and uncertainty surrounding regulation are preventing a “normal” recovery from unfolding. E = OECD estimates. Data as at July 24, 2014. Source: Organization for Economic Cooperation & Development (OECD), Haver Analytics. Data as at July 24, 2014. Source: Bank for International Settlements, Haver Analytics. If we are right that this backdrop is the base case, then we believe companies that can deliver greater value to consumers are likely to prosper. We also think that buying patterns are changing aggressively. In the Netherlands, for example, we met with one retailer that has seen a 40% drop in curtain purchases (i.e., home related goods) in its stores; by comparison, demand for certain small “impulse” items were running positive in the double digits. These shopping preferences are exactly what we saw in the United States until 2014 (when consumers finally begin to gain enough savings and confidence to replenish bigger ticket items like autos and home improvement). For companies that do not play in the “value segment” of the market, we believe that consolidation will be required as low inflation and weak consumer demand will keep revenue growth in many industries at lackluster levels. To be sure, companies with more of a global footprint can reinvest outside of the Eurozone, though we think this initiative is more of a multi-year – not multi-month — endeavor. Consistent with this macro-economic backdrop, we heard zero instances where additional liquidity is driving loan demand. Why? We think because growth – though improving – is trailing past recoveries. There is also the growing trend for those companies that are investing to raise capital outside the traditional banking sector. This viewpoint is significant because it means that Europe is trending more towards a U.S.-based capital markets framework for financing. 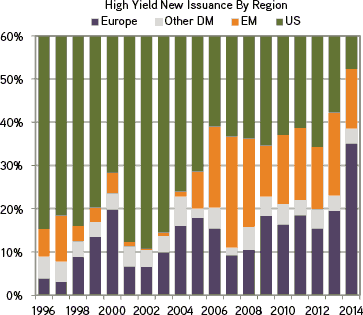 As such, we expect the recent growth in the European high yield credit market to continue. Data as at April 30, 2014 thru 4Q13. Source: European Central Bank, Haver Analytics. Data as at July 2014. Source: BofA Merrill Lynch Global Research. No question, at the lower tier of the market, there is an opportunity for non-bank lenders to extend credit to companies that are too complex or too risky for traditional banks to serve, but this opportunity represents a minority part of the total corporate market. Moreover, we also think that, while these SMEs think that they need cheaper financing, in many cases what they really need is more equity, as many businesses are performing below trend amid Europe’s modest recovery. So, as we look ahead, we think there are some important lessons from the United States that can be applied to Europe. If we are right, then low cost producers, consolidators, and value offerings are all likely to not only grow faster but also to experience multiple expansion along the way. At the same time, we think that companies that do not adapt to the new macro-environment we envision are likely to experience slower growth, lower margins, and falling returns. The environment that we are describing also has significant implications for the entire financial services system in Europe. Non-bank lending is likely to gain momentum, but the need for equity by smaller firms and the ability to access the bond market are the more important stories, in our view. Equally as influential is our strong view that overall credit demand could surprise on the downside, which means banks will be forced to look in other areas for revenues. In addition, the ECB could end up holding rates lower than what the market currently forecasts, a scenario that—despite the Fed’s best intentions—played out in the United States. Political fragmentation and geo-political concerns are growing risks. 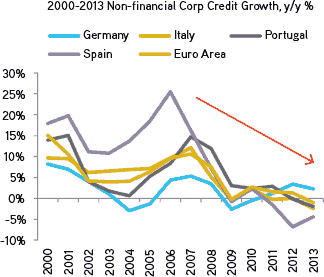 In our view, the biggest macro threat in the Eurozone is not high government leverage. As we mentioned before, the ECB is now playing a more visible role and we expect this to continue. In addition, we expect global growth to help Europe post stronger growth numbers in both 2015 and 2016. Rather, we highlight the risk of fragmentation in areas like Scotland, Catalonia, and/or Greece. In particular, we do wonder whether many investors are not paying enough attention to the social-economic splintering that has now seeped into this region of the world. Youth unemployment approaching 60% in Greece and 46% in Italy has – not surprisingly – energized a class of European citizens, while issues surrounding tax revenues and social expenses have increased tensions ahead of election season in Spain7. Demand for a change in EU policies was certainly front and center in the May European parliament elections where close to a quarter of the seats were won by Eurosceptic parties, ones that want to break up the EU or at least curtail its influence and halt further integration amongst its member countries8. The other potentially under-appreciated risk in Europe is geo-political. Tensions associated with the Ukraine situation were certainly top of mind with many of the government officials with whom we spoke. Meanwhile, in London we made our regular trip to the Speakers’ Corner in Hyde Park, where we saw tensions surrounding Israel and Palestine literally dominate almost every discussion. Conclusion: Both the Complexity and Opportunity Set in Europe Have Increased. In what at times felt like Version 2.0 of the John Candy/Steve Martin comedy Planes, Trains, and Automobiles, our recent trip to Europe again reinforced that investing wisely in Europe is continually refining one’s understanding of where the marginal change is occurring. Simply stated, the European beta “bounce” is now waning. As such, understanding the shifting macro trends that drive micro results at the sector and company level will now dictate the return profile of investments in 2H14 and beyond. For our nickel, Germany, Spain and the United Kingdom are likely to remain the growth outperformers. In spicier markets like Greece, NPLs and tourism have emerged as two interesting opportunities, in our view. Our travels lead us to be supportive of industry consolidators and/or companies with margin improvement potential. We also think the trend towards “value” in Europe will grow stronger. In particular, we think value-oriented stories are likely to both grow faster and enjoy additional multiple expansion in the months and quarters ahead. Key to our thinking is that, similar to what we saw in the United States in recent years, stagnant real wage growth in Europe will materially reshape traditional consumption patterns in the region. Contrary to consensus thinking, we now see the upcoming bank stress test as a positive, not a negative. 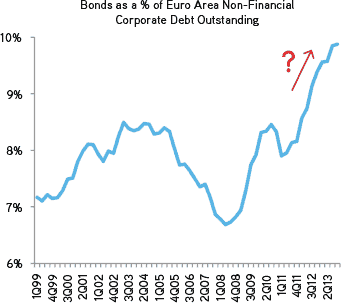 If we are right, then European equities and credit could remain strong performers in the coming quarters. Finally, if we had to leave investors with one thought, it would be that the recent emergence of a more engaged European Central Bank is not to be under-estimated, particularly at a time when its closest peer, the Federal Reserve, is about to reverse its monetary policy directive. 1	Data in bullets as at June 30, 2014. Source: Bloomberg, European Central Bank, Markit, the European Commission. 2	Data as at July 24, 2014. Source: Markit. 3	Data as at July 24, 2014. Source: Instituto Nacional de Estadistica, Haver Analytics, KKR Global Macro & Asset Allocation analysis. 4	Data as at July 2014. Source: KKR Global Macro & Asset Allocation analysis. 5	Data as at June 27, 2014. Source: Office for National Statistics, Bureau of Economic Analysis, Statistical Office of the European Communities, Haver Analytics. 7	Data as at 1Q14. Source: Istituto Nazionale di Statistica, Statista 2014, Haver Analytics. 8	Data as at May 25, 2014. Source: Citibank Global Political Insights. The views expressed in this document are the personal views of Henry McVey of Kohlberg Kravis Roberts & Co. L.P. (together with its affiliates, “KKR”) and do not necessarily reflect the views of KKR itself. This document is not research and should not be treated as research. This document does not represent valuation judgments with respect to any financial instrument, issuer, security or sector that may be described or referenced herein and does not represent a formal or official view of KKR. This document is not intended to, and does not, relate specifically to any investment strategy or product that KKR offers. It is being provided merely to provide a framework to assist in the implementation of an investor’s own analysis and an investor’s own views on the topic discussed herein. This document has been prepared solely for informational purposes. The information contained herein is only as current as of the date indicated, and may be superseded by subsequent market events or for other reasons. Charts and graphs provided herein are for illustrative purposes only. The information in this document has been developed internally and/or obtained from sources believed to be reliable; however, neither KKR nor Mr. McVey guarantees the accuracy, adequacy or completeness of such information. Nothing contained herein constitutes investment, legal, tax or other advice nor is it to be relied on in making an investment or other decision. There can be no assurance that an investment strategy will be successful. Historic market trends are not reliable indicators of actual future market behavior or future performance of any particular investment which may differ materially, and should not be relied upon as such. Target allocations contained herein are subject to change. There is no assurance that the target allocations will be achieved, and actual allocations may be significantly different than that shown here. This document should not be viewed as a current or past recommendation or a solicitation of an offer to buy or sell any securities or to adopt any investment strategy. The information in this document may contain projections or other forward-looking statements regarding future events, targets, forecasts or expectations regarding the strategies described herein, and is only current as of the date indicated. There is no assurance that such events or targets will be achieved, and may be significantly different from that shown here. The information in this document, including statements concerning financial market trends, is based on current market conditions, which will fluctuate and may be superseded by subsequent market events or for other reasons. Performance of all cited indices is calculated on a total return basis with dividends reinvested. The indices do not include any expenses, fees or charges and are unmanaged and should not be considered investments. Neither KKR nor Mr. McVey assumes any duty to, nor undertakes to update forward looking statements. No representation or warranty, express or implied, is made or given by or on behalf of KKR, Mr. McVey or any other person as to the accuracy and completeness or fairness of the information contained in this document, and no responsibility or liability is accepted for any such information. By accepting this document in its entirety, the recipient acknowledges its understanding and acceptance of the foregoing statement.